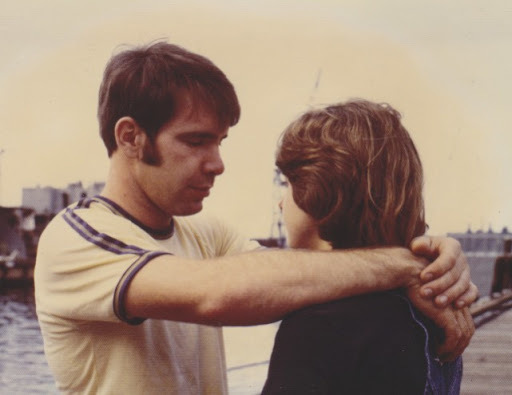 In 1978 I traveled to Baltimore, Maryland with Mark’s parents and his Aunt Terry. Mark was in the Navy and stationed in Baltimore and was to get his tonsils removed at the Naval Hospital in Annapolis on Monday morning. We left Muskegon on a sunny Saturday morning but we were late. I didn’t know Mark’s parents very well at the time but I stayed at their house so we could leave early. I woke up and got ready and no one in the house was stirring. I waited an hour and finally got enough guts to go knock on Mark’s parents’ bedroom door to wake them up. Everyone hurried and got ready and off we went driving a stick shift Nova while pulling a camper trailer. We drove all day and were entering the mountains in Pennsylvania and Mark’s dad was tired and asked me to drive. I said, “Sure, but I don’t know how to drive a stick shift.” Mark’s mom said, “No problem. You control the foot shifter on the floor and I will control the stick shifter.” It worked and I drove for awhile. We arrived at Mark’s ship in the early evening and picked him up. We drove to a campground and set up camp. We were soaked by the time we got back to the campsite. We were staying in a pop-up camper with Mark’s parents on one bed, Aunt Terry and I on another and Mark on the floor. Mark and I held hands all night long. That was the beginning of our long future together. I can’t believe I was so bold in my early twenties, but I knew what was right for me and that was Mark.